Just a touch of crunch on the edge with a soft and chewy center. 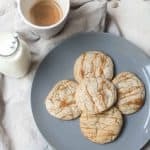 These salted caramel cookies have a touch of caramel in the batter, caramel chips and salted caramel drizzle for ultimate sweet snacking. Preheat oven to 350°F. Starting on slow and increasing speed to medium-high, beat butter until soft and pale, about 3 minutes. Add granulated sugar and brown sugar, mix on medium-high speed for 1 minute. Add egg, vanilla, and salt. Mix to combine, scraping the bottom of the bowl. Add baking powder, baking soda and flour. Start on low speed until incorporated, add 2 tablespoons of salted caramel¹ and increase speed to medium to combine. Slowly add caramel chips and mix until combined. Using a large cookie scoop, roll each scoop into a ball and place on a baking sheet lined with parchment paper or a silpat mat. If you don’t have a cookie scoop, use about 2 tablespoons of dough per cookie. Sprinkle lightly with coarse sea salt. Bake for 13-15 minutes, let cool 15 minutes, then drizzle with remaining salted caramel. ¹ You can find the recipe for salted caramel in this Salted Caramel Pretzel Cake. This will yield about 3 1/2 cups of salted caramel. If only using for this recipe with no option for storage, opt for a store bought option, or just make the cake too.